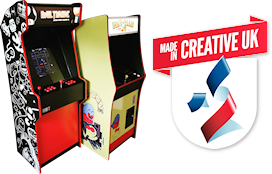 Adding an arcade machine (or two) to your wedding day can be a real crowd pleaser! Whether it's post ceremony, helping to entertain your guests while you work with your photoghrapher of at the evening reception, the machines are great fun for all your guests. We're happy to liase with your venue or weddign planner so there's as little extra work and stress for you as possible. The prices shown below are based on the rental of our dedicated, upright arcade machines with a free-play version of our coin-operated games system comprising approx. 100 games. The prices are based on rental for a one day event, with delivery/drop off the day before the event and collection the day after the event. Longer rentals are available with prices available on application. This is to cover any damages that may need to be repaired by us following your rental. We expect some wear and tear so unless the damage is severe, we normally refund the whole £100 ... The machines are meant to be played and enjoyed!! We only ask that no drinks are put on the machine(s) during the rental. A £100 deposit (per machine) is required to make a booking with the balance to be paid (including the £100 insurance) approx. one month before the event. All payments for rentals must be via bank transfer. We don't accept cash.